If you have seen the BMW X3 on the road, then you know it’s one of the most beautiful luxury class compact SUVs on the road right now. US News & World Report stated that it was a great buy with a higher-than-average rating for safety, performance, and interiors. That’s because the all new redesign has given BMW drivers something better. The latest models include both cargo room, comfortable seating, and fuel efficiency, while not giving up on the top power and performance features. At the base engine, you’ll get 245 horsepower, which you can upgrade all the way up to 350 horsepower. The sDrive30i is an all new trim from BMW that uses rear-wheel drive performance. You can instantly make heads turn with the performance on the higher trims. The technology packages in this vehicles is also insane, providing more horsepower with every additional trim. 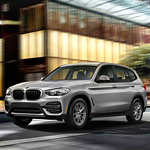 Want to get into a new BMW X3? It’s a great car to start driving today. You can test drive it at BMW of Visalia or you can go online to get more information.